LAW REQUIRES THIS WARNING LABEL ON TOBACCO PRODUCTS RIGHT? YUP! YEAH! I'VE SEEN THE ANTI SMOKING COMMERCIALS ON TV AS WELL! YOU SEE THIS WARNING LABEL WITH EVERY PACK YOU BUY AND, YOU'VE BEEN EDUCATED ON THE DANGERS OF TOBACCO USAGE. 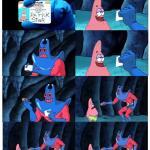 THAT MAKES SENSE TO ME! SO SINCE YOU CHOSE TO USE TOBACCO PRODUCTS FULLY AWARE OF THE HEALTH EFFECTS. WHEN YOU'VE ALREADY BEEN WARNED OF THE DANGERS THEN, YOUR HEALTH PROBLEMS ARE YOUR FAULT. THEN IT'S YOUR FAULT FOR NOT QUITTING! NAH! 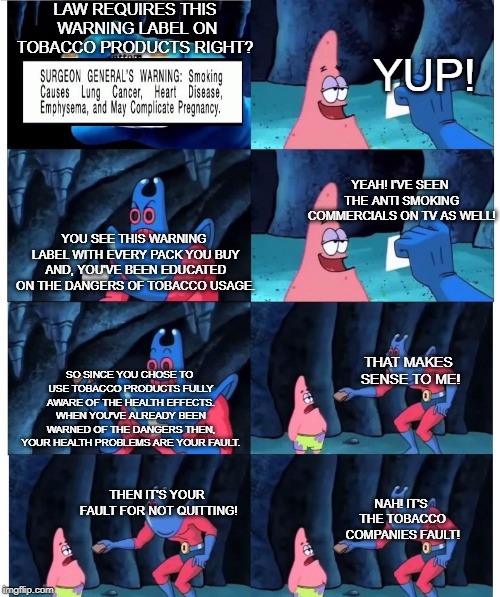 IT'S THE TOBACCO COMPANIES FAULT!